The first time I ever laid eyes on a Charvel was at Sam Ash Music on 48th Street in Manhattan back in the Eighties. At the time, Charvel guitars were hard to come by on the East Coast because very few dealers carried the company's custom Californian creations. So, the only place to really see the finest examples of these instruments was on Music Row — 48th Street’s mecca of music stores. One Charvel that caught my eye was a simple black model with one humbucking pickup and a non-locking bronze vibrato bridge that cost nearly $3,000! Of course, hair metal and its guitar slingers were all the rage, and those were the instruments, along with Jacksons, that these guys were playing. Mind you, sunburst Les Pauls and vintage Stratocasters were actually cheaper then! But once the reign of hair metal died with a neon whimper, naturally, the prices of those Charvels dropped considerably, but the love for them still remains, and let me tell you — they’re better than ever now. Let me call into evidence the brand-new Charvel Pro-Mod DK24 HSH 2PT CM (yes, it’s quite a mouthful of a designation), which is far removed from that old bare-bones model I lusted after and might just be the ultimate Charvel I’ve ever come across, with a price that defies all that it offers. FEATURES The Charvel Pro-Mod DK24 HSH 2PT CM puts the “super” in superstrat. From top to bottom, the guitar is decked out with slick appointments, custom electronics and premium hardware. 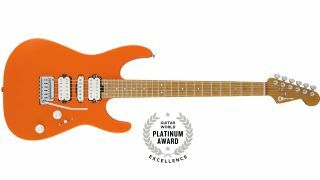 Maybe it’s the satin orange crush finish (the guitar also comes in matte army drab) that gives this Dinky’s slim-contoured alder body an almost played-in, speedy appearance. But the real accelerator here is its two-piece, bolt-on caramelized maple “speed” neck with a hand-rubbed urethane finish, a generous sculpted heel, graphite reinforcement, heel-mount truss rod adjustment wheel, Luminlay side dots, 24 jumbo frets, pearloid dot inlays and Graph Tech nut. The versatile HSH pickup configuration includes a Seymour Duncan Custom Full Shred SH-10B bridge pickup, Seymour Duncan Custom Flat Strat SSL-6 single-coil middle pickup and Seymour Duncan Alnico II Pro APH-1N neck pickup, all mounted directly into the body with flat parchment covers. Other cool inclusions are a five-way blade pickup selector with custom-wired pickup switching, 500K EVH Bourns low-friction potentiometer volume and no-load tone controls (in parchment Stratocaster-style skirt knobs), rear-mounted input jack, Gotoh Custom 510 tremolo bridge and locking tuners. PERFORMANCE For me, the standout feature of the Pro-Mod DK24 is its caramelized maple “speed” neck with a 12-16–inch compound-radius and comfortably smooth rolled edges. It’s rather sweet for a “caramelized” (roasted) neck, but aside from the obvious pun, it looks killer, and the torrefaction adds stability with a raw wood feel, plus a lively pop in tone. Neck profiles can be an endlessly debatable partisan issue — some like ’em big, others small. But here, both sides of the aisle will agree this is the best neck shape for speed that doesn’t reek of compromise. But let’s also talk tone here, because the Pro-Mod DK24 delivers an abundance of juicy blends with its Seymour Duncan pickups. The blade selector does not have the typical five-way wiring scheme, but instead splits certain coils while disengaging others to give you a better-sounding range of single-coil sparkle, midrange clarity and full-throttle humbucking slice. It’s a great foundational moderate-output tone that allows you to add plenty of color between your amp and effects. Add to that the remarkable low-action setup, the smooth throw of the Gotoh tremolo, and you have a guitar that practically plays itself.